As a season ticket-holder of box seats in the right-field corner, Thomas Morrissey has not actually seen a pitch reach home plate during a game at Fenway Park in 12 years. Not that he could have ever cared any less. Since 1999, Morrissey has made the long trek from his home in North Attleboro to Friendly Fenway for every home game. From the slightly elevated vantage point offered by his two seats in the right-field loge box just in front of grandstand Section 5, Morrissey proudly boasted to friends about his unrivaled view of the spacious patch of grassy real estate dutifully manned in recent years by the likes of Trot Nixon, J.D. Drew and Eric Hinske. And, while beauty can sometimes be exclusive to the eye of the beholder, absolutely no one had a better view of the visiting team’s bullpen catcher. The glory days for Morrissey appear to have come to an abrupt, ever-so-cruel end. 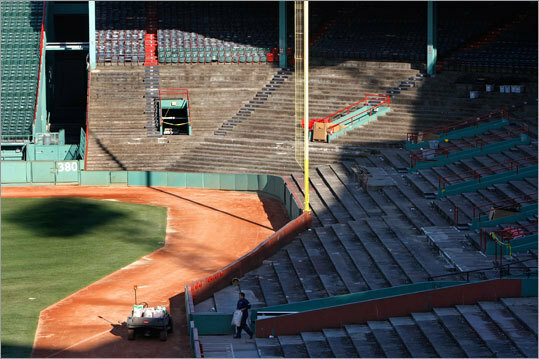 As recent photos on the Boston Globe website confirm, the Red Sox have torn up the lower seating bowl housing the right-field boxes and plan to re-pour the cement footing later this year before replacing the north-facing seats with chairs that will presumably* be angled to the west (i.e. oriented toward home plate). *Fenway Pastoral is not currently owned by the same corporation as the Boston Red Sox and, thus, team officials declined (rudely) to provide final blueprints of the construction plan. Adding insult to injury, the organization also has plans to install several high-definition video screens above the outfield bleachers. While swiveling one’s neck in either direction as needed may sound like a perfectly reasonable compromise, 30-year season ticketholder Gretta Lebowicz advises against that technique. It’s been over 25 years since Nancy Cone saw a home run at the point of contact. Yet she, too, echoed the opinions of Lebowicz and Morrissey. Now we wait, with bated breath, for the inevitable accounts of Moss’ last days in New England. Perhaps there is a Jack McCormick-like shoving incident that can be pointed to by revisionists as the impetus to a deal being consummated. In-season trades of surefire Hall of Famers like Randy Moss and Manny Ramirez just don’t come to be all that often, particularly when the team trading away the superstar is a fair bet to make the postseason. To paraphrase Jerry Seinfeld: Of course it ended badly. Nothing would ever end if not on a down note. The logical view from an impartial distance is that both the Manny and Moss deals were defensible in that they represented long-view business decisions. Both trades represented aging stars leaving town in the hopes of one last payday predicated as much on what he has done in the past as what he can be expected to do in the future. Over the years, the malcontent storyline has become stock language amongst local media. It is a fallback explanation that has become as lazy as the “Manny Being Manny” nonsense that was co-opted by some into “Randy Being Randy” when it became convenient. Before either ever stepped off a plane at Logan—Manny in 2001 and Moss in 2007—both were unfairly depicted as self-absorbed, over-privileged A-holes. It was never a matter of if pundits would turn on either player; it was just a question of when. Moss’ press conference after Game 1 of the 2010 season was the latest case in point. When there’s a microphone in the room, You’re Damned if You Don’t, But You’re Almost Certainly More Damned if You Do. Shaquille O’Neal has played the media game deftly for years, but he better be taking notes. Given the climate of coverage around here, what incentive do our professional teams have to dispel rumors of dissatisfaction and “cancerous” locker room behavior? Whispering into columnists’ ears about lack of effort is a transparent and foolish tactic, but team officials will continue to do it because there are always a few takers willing to ignore things like reality and game film. Ironically, the Moss news came on the same day that The Sporting News released its “Best Sports City” rankings, which had Boston at Number 2. Presumably, TSN’s algorithm has been weighted heavily on the fact that Boston is relatively blessed with competitive teams and high-profile stars. But it’s fair to question whether all the winning in this town has actually changed the negative perception that many athletes of past generations had of playing in Boston. The success of otherworldly players like Moss—and Manny and countless others before him—is almost impossible to enjoy in the moment, unabashedly, without worrying that their high statistical outputs would eventually lead to unfair expectations and trifling scrutiny within the media. While it is as much a cliché to continuously blame the media for a star player’s “unfair” treatment, New England’s fanbase is certainly not at fault for either Moss’ or Manny’s deciding enough is enough. Great athletes all have breaking points—it comes with the territory of eccentric, unique ability. It’s just a damn shame the guys with the microphones and notepads keep reinventing the need to test these thresholds.